University of Hawaii athletic director Herman Frazier stops short of saying all major sports events at the local university are headed toward pay-per-view, but football is another matter. The driving force behind the lucrative pay-per-view deal the university has with KFVE and Oceanic Time Warner Cable is June Jones' Warriors. Because so many UH football games were selected by ESPN this year, it forced Frazier to put most of the away games on the pay-per-view package to keep his local broadcast partners from losing money. The move angered some local viewers, an issue Frazier will have to address when the new television contract is hammered out in the spring. The athletic director also added several men's basketball and women's volleyball games to the pay-per-view package this year to add value for the increased cost, including today's Rainbow Wahine volleyball match at No. 1-ranked Nebraska. The future of the University of Hawaii's pay-per-view sports package and whether it will continue to grow in size and cost are questions the athletic department will face in the coming months -- especially with a new contract up for grabs next year. In each iteration of the six-year service, there has been an increase in either pricing or number of events showcased -- and usually both. No one currently involved, however, will predict the direction the service will go, especially with the new contract to be bid on in February or March. 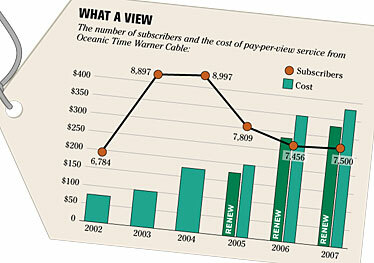 If it's any solace to subscribers who have seen UH's pay-per-view swell from an experiment to a multimillion-dollar cash cow, the university, KHNL/KFVE (which currently owns UH's television rights) and distributor Oceanic Time Warner Cable believe the trend of adding more events to the package each year, thus justifying rising costs, will subside at some point. When asked directly whether all UH events will appear on pay-per-view eventually -- in the next contract or beyond -- athletic director Herman Frazier said, "No. My crystal ball tells me no." Portents aside, KFVE General Manager John Fink echoed that sentiment. The "Home Team" has held the TV rights for the past 25 years. "I think when you look at where it is now, it's been relatively stable the last couple of years," Fink said. "There's a (extra) game here and there, but not huge increases. Our goal has always been to keep most of the events (on KFVE), and we still do. Over 85 percent of the events are still free on KFVE." Representatives of all three major parties involved -- including Norman Santos, Oceanic vice president of operations -- say they are satisfied with the success of the ever-growing package. In every year since its inception, the cost of UH's pay-per-view package has risen, from $75 for seven UH home football games in its debut year in 2002, to $330 for renewing customers on Oahu this year ($380 for new customers) for a much broader palette. Six women's volleyball and five men's basketball games were included, for a record total of 19 events this year. The total number of games was 15 in each of the two previous years, when the package was expanded to encompass multiple sports. It generated more than $400,000 for UH in its first year, an amount that has grown considerably since. In the current TV contract, signed in 2004, the university gets a front-loaded $1.75 million each year, and an estimated $2 million total. But all that expires at the end of the year, when the new contract is up for grabs. "I don't think anybody has a clear picture (of where it's going)," said John McNamara, UH associate athletic director. "I think we need to sit down and meet with our TV partners (Oceanic and KFVE). We need to take all the feedback that we've received from the fans, both the season-ticket holders and the folks who subscribe to pay-per-view." Ultimately, McNamara said, the goal is to get as many fans as possible out to the games. Popularity for pay-per-view peaked in the 2004 season, when 8,997 customers statewide subscribed for seven football games. But in 2005, the cost jumped again to $200 for new subscribers, with the addition of nine volleyball and basketball games. It also marked the first time road football games were added, a sticking point for some UH fans. Arthur Baverstock, 74, subscribed from the beginning at his daughter's house in Waimanalo, but dropped the package two years ago. He wasn't alone; by 2006, the user base dropped about 21 percent to 7,456. "When they added basketball and volleyball (that's when I decided)," Baverstock said as he watched the Warriors play Idaho at The Shack in Kailua. "It upped the cost and it was things we didn't watch. Even now we shouldn't have to pay for away games." He sounded skeptical about re-subscribing in the future, and quipped, "At least it'll be good for the sports bars." Fink and Frazier said the other sports were meant to include some value in the package for everyone, but Santos conceded, "That really hasn't done very well. Football, like in everything else, is the driver behind this." Prior to pay-per-view, games were not shown live on television but were instead recorded and broadcast later. Pay-per-view's impact on attendance at UH home football games at Aloha Stadium has been a concern, one that hasn't escaped the attention of coach June Jones. "No question it has (hurt attendance)," he said. "We're making more money, but we have to find a happy medium. You probably have 150,000 people watching the game on a given day and (average 34,781 in three games this year) at the stadium." Three road football games were part of the package this year, a byproduct of ESPN picking up four of UH's games in a hyped season featuring Heisman Trophy candidate Colt Brennan. That includes home dates against Western Athletic Conference rival Boise State and Washington of the Pac-10. "Normally, those are games that would have been on our pay-per-view. ... KFVE and Oceanic had to do that (adding road games) because they lose some of their inventory to ESPN," Frazier explained. "But that's because we're successful." He added that if the requisite number of football games were included in the package, he would choose not to include basketball and volleyball. Some fans, such as Hugh and Karen Wakuzawa, allow that the continuous rising cost of being a UH fan is a concern, but didn't let that stop them from enjoying the package. They host robust parties of about 15 people every football weekend at their home in Kapahulu, and have subscribed since the start -- in addition to being season-ticket holders. Hugh Wakuzawa sees the addition of other sports to the package as a benefit not a bane. "It made the price increase more acceptable," he said. "It's supporting the school, so I don't mind doing that. I would continue (if the price remained about the same) in that way. I think that any sport, as the team goes, the fan base goes. And the package will be as good as the team goes, and people will continue on supporting the package." Santos said that the subscriber base has indeed increased again this year, thanks largely to UH's resurgent program. The Warriors are 7-0 and are coming off an 11-3 season. He felt the service's pricing was still within the range of other comparable pay-per-view programs on Oceanic's sister stations, but its current success was at or near its apex considering the cost. "From a personal standpoint, I thought it was overpriced this year," he said. "I think there's a (time) where you reach a saturation point, and people will start to rebel in one form or another." Santos said he would be open to UH parceling out the rights to various entities to encompass things like Internet broadcasting, but that was at UH's discretion in the new contract. While he said it's too early to tell how many players will be in the mix next year for the University of Hawaii's sports television rights bidding, John McNamara, UH associate athletic director, said 25-year incumbent KHNL/KFVE will get the first shot. McNamara said that sitting down with KFVE General Manager John Fink at the start of 2008 would be the first of many steps in determining the potential for an extension with KFVE or opening up the bidding to other potential suitors. "We'll have a fruitful dialogue, but can't choreograph the discussion (if an offer would be made)," McNamara said. "We'll sit down with KFVE and review things and see what's best." The last contract, signed in 2004, granted UH a front-loaded $1.75 million each year, plus revenue sharing for UH pay-per-view income with KHNL/KFVE and Oceanic Time Warner Cable. Fink and Oceanic Vice President of Operations Norman Santos have expressed interest in the new contract. 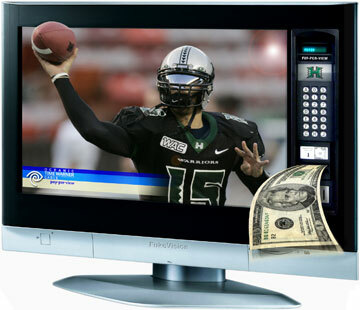 Bidding for the next UH television contract begins in early February or March. Oceanic was KFVE's chief opposition in the last round of bidding, but the incumbent came up with the highest bid in the end and the two are currently partners in distributing UH football, basketball and volleyball games through Oceanic. Fink expressed confidence that KFVE would seek to continue its long-standing relationship with the university. "We think it's been a great partnership, not only with us and UH, but with our clients and most importantly perhaps with the viewers," he said. As for future pricing, McNamara said it had yet to be worked out and the university would "look for the best interest to the UH athletic department and its fans." He explained that once the football season ended, the process would begin in earnest. The contract prior to 2004 was worth about $700,000 per year for UH.